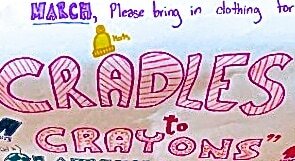 Please bring in clothing for the "CRADLES to CRAYONS" Clothing Drive! New and gently used clothing is needed for infants to 12 year-olds. The donation box is located in the MVHC lobby for the month of March. "Thank you so much for reading about my project! Cradle to Crayons (https://www.cradlestocrayons.org) is a charity for families with children who can't afford clothing on top of other necessities. The is clothing drive actually part of my overall project; Project 351. Project 351 is an organization where every school district in Massachusetts (there are 351) selects a student to represent them in Boston. I was selected to represent West Tisbury. Every student is required to do a year of service to remain active in the program. At the end date of the clothing drive, the clothing will be collected by Project 351 and delivered to the charity. The clothing will be shipped to the families who need them. Donating is a good way to get rid of older kids' clothing that people don't know what to do with. Again, thank you so much for doing this!" ​ Rachel will be called to the Bima as a Bat Mitzvah on Saturday, May 13th. All are welcome! I would like to thank everyone who donated children’s books to my mitzvah project. With your help, I collected over 1000 books! They were delivered to Horizons for Homeless Children and Reach Out and Read, two organizations that help promote literacy. I also donated some of the money I received for my Bat Mitzvah and all of the money I made selling my bookmarks to two other literacy organizations, PJ Library and Jewish Coalition for Literacy. January 4, 2013 was a day I anticipated for several months – not because it was my wife’s birthday, but because I was departing for Israel to volunteer with a nonprofit organization called Volunteers for Israel. Mitzvah of the Month Volunteers! community. These acts of caring would take no more than 2 hours once/month. What would they be? We have members who would love visitors at Windemere or at home. We also have members who are either ill or housebound and may need someone who can drive them to shul or to a doctor's appointment, make a pot of soup, do a grocery shop, pick up mail, or sit with them while their spouse/caretaker can take a walk or a break. Finally, we have members saying Kaddish who need a minyan during shiva or on Shabbat for a yahrzeit. We would like to maintain such a mitzvah list for every month, so let us know if you can do a mitzvah once a month or if you would prefer to volunteer for a particular month. One mitzvah can make a huge difference in someone's life, both the one receiving and the one who is giving. Please let the Rabbi, Nancy Salon-Nunes or Max in the office know if you would like to be one of our "36" mitzvah mentches this month or on a regular basis. If you are particularly busy, consider making a donation of $36 to our caring committee which would cover one hour of an aide helping one of our members out.